Project Website: we have just launched our project website: http://www.bizsims.edu.au/. 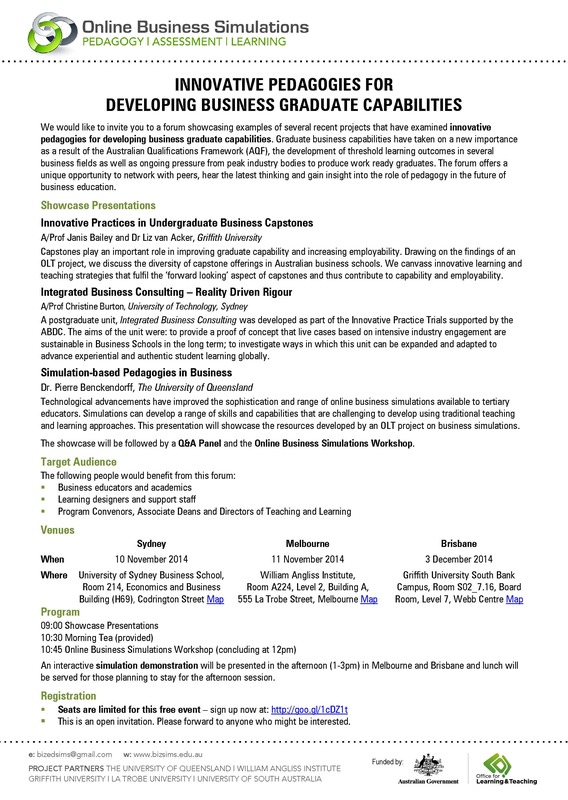 The site provides resources for business educators interested in using online simulations to develop graduate capabilities that may be difficult to develop or assess using traditional pedagogies. Resources include case studies, assessment guides, marking rubrics, simulation profiles, a student learning barometer and other tools. We would like to invite anyone interested in online business simulations to visit the website and join our project community. The website will continue to grow as we develop more resources and case studies. The forum offers a unique opportunity to network with peers, hear the latest thinking and gain insight into the role of pedagogy in the future of business education. Forums will be hosted in Sydney (10 November), Melbourne (11 November) and Brisbane (3 December). Further details are attached. The Melbourne forum has been timed to coincide with the National Peer Review of Assessment Network Forum (12 November) and the Curate, Credential and Carry Forward Digital Learning Evidence National Forum (13 November).